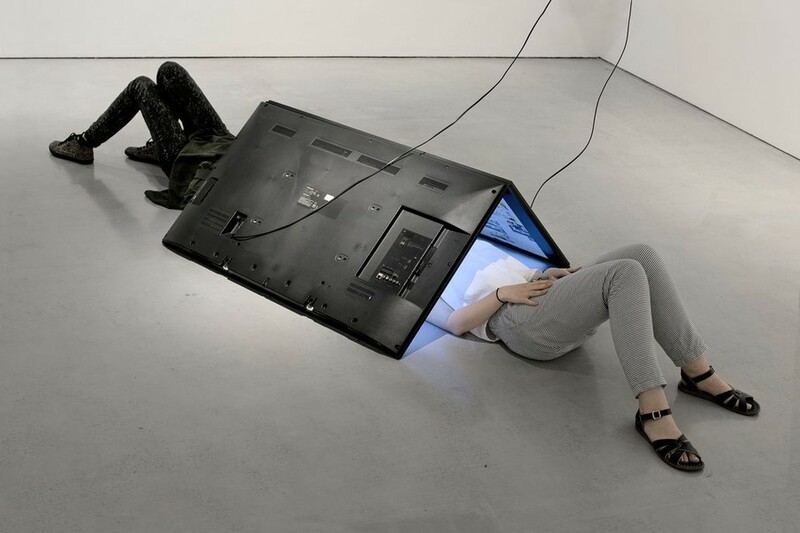 Visual Reality Meets Visual Art in the MCA's "I Was Raised on the Internet"
When the Museum of Contemporary Art (MCA) announced that it would be displaying 100 multimedia art objects by artists at the global forefront of technology and art, it was difficult to know what to expect. I Was Raised on the Internet, curated by Omar Kholeif, opened its doors to the public on June 23 to great anticipation. The exhibition, whose scope stretches from 1998 to the present day, investigates how millennials have navigated, and still do, a world continually shaped by technology. I Was Raised on the Internet places familiar digital experiences in hyperreal situations. In a commissioned video by the New York–based collective DIS, a lecture on the evolution of America’s financial markets is delivered by a suited figure who resembles a comic-book supervillain. Mendi + Keith Obadike’s “Blackness for Sale” (2001) repurposes an eBay listing to point to the modern commodification of colonized bodies. Thomson & Craighead, another pair of virtual artists, aggregate images of military sites from Flickr to form “A Short Film About War” (2000). The immersive exhibition is organized into five sections that each focus on a different mode of viewer-art interaction, with titles worded as imperatives. The first, “Look at Me,” explores the performance of identities on social media. On view are large-scale Instagram posts that the Los Angeles–based artist Amalia Ulman made of herself living a “perfect” lifestyle, complete with comments from viewers who perhaps don’t realize her artistic performance. The section titled “Touch Me” oscillates disconcertingly between digital spaces and physical ones. “Control Me” examines the implications of authoritarian surveillance through the growing predominance of network technologies. Trevor Paglen’s “Autonomy Cube” allows users to connect to its hyper-protected Wi-Fi that promises total protection from any kind of surveillance. The freedom to search for anything one’s heart desires prompts visitors to reimagine their lifestyle as if the government were not watching. “Play With Me” immerses users in “virtual experiences.” Daniel Steegmann Mangrané’s “Phantom (Kingdom of all the animals and all the beasts is my name)” (2014–2015) involves virtual reality goggles that instantly place the viewer in a forest of white, shadowy trees in the dead of night. Near it is a blue, blank screen with several buttons underneath. The gallery attendant told me that he thinks of the installation as a complete experience of a remade world, jargon that was reminiscent of Jurassic Park’s premise. The final section of the exhibition, “Sell Me Out,” calls out the commercialization of online spaces, targeting corporations such as Amazon and Tesla, and our own complicit support by using their services. Global concerns about capitalism, torture, objectification, data rights, and surveillance play out through deeply intimate exchanges within the featured videos, paintings, and sculptures. The results are chilling and occasionally downright disturbing. In aggregate, the exhibit disrupts the comfort and trust we place in technology’s power to improve our lives, and exposes faults in the modern utopia that technological innovations appear to champion. Violence and satire are supplied in heavy doses to push viewers to reflect on their own positioning within the ever-evolving technological landscape. Visitors may feel discomfited, befuddled, or amused by the selection of multimedia pieces. But one need not be fluent in new media theory to navigate the exhibition, or any more adept at picking up new technologies than the next Gen Y member. I Was Raised on the Internet is most legible when visitors reflect on their own relationships with technology. The exhibition, Kholeif writes, seeks to make its visitor an “active agent.” It avers that no one is unaffected by technology’s pervasive influence, and everyone (yes, you!) can participate in the conversation.